I’ve been travelling in the Med this week on board Carnival Vista – the newest and biggest ship in Carnival Cruise Line’s fleet. 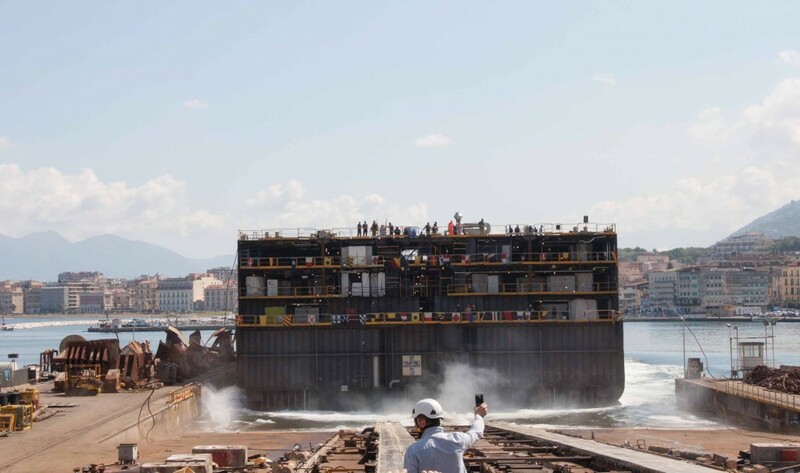 The yard, in the Bay of Naples and just a few miles from Sorrento, does not have a dry dock and does not have the facilities to build ships the size of the 133,500-ton Vista. It is more used to constructing smaller vessels, many of them for the Italian Navy. 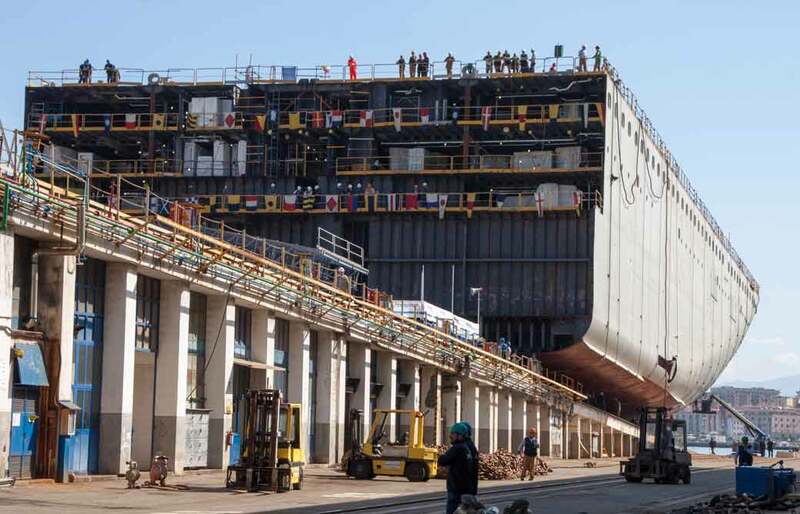 But in order to meet the commitments of a full order book, Fincantieri used Castellammare to build a section of the as-yet-unnamed Vista 2 – just as they did last year for Majestic Princess. Even though it was not a whole ship, the launching ceremony was gloriously old-style, and a reminder of how vessels such as Cunard’s QE2 used to be launched on the Clyde. I climbed a steep stairway to a viewing platform part way down the slip. Behind me were massive wooden blocks that had supported previous vessels. In front of me was a section of Vista2’s hull. Workers milled around on the slipway and others were gathered at railings on board. A Roman Catholic priest blessed the ship and splashed generous amounts of holy water over shipyard executives and Carnival president Christine Duffy, who was to be the ship’s madrina, or godmother. 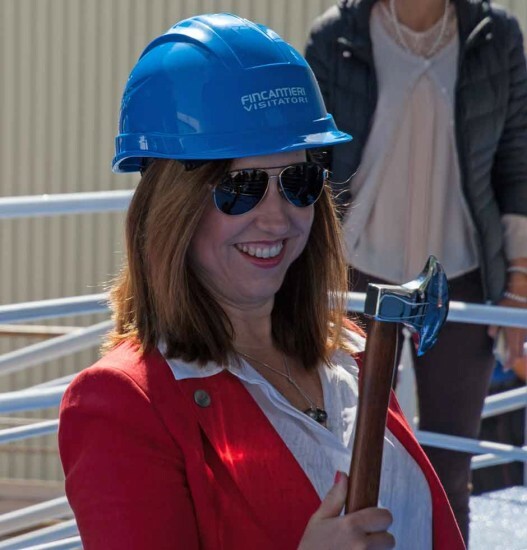 Wearing hard hats, the workmen disappeared beneath the hull and set to with sledgehammers, knocking out the supporting wedges and props with an enormous clamour of banging and clattering. As it reached the critical point, defying gravity and held in position only by friction and the last chains, Duffy used a silver axe to cut a ceremonial cord, a bottle of Champagne shattered against the hull, and the hull section slid towards the sea, gathering pace all the time. Almost as one, the workmen flung their gloves towards the steelwork and – apart from those videoing the event on their mobile phones – threw their arms in the air, cheered loudly, and then hugged and kissed each other in celebration. The ship section reached the water, restrained by heavy chains, and was gently nudged into place by two waiting tugs. It was an emotional moment, and one I may never get the opportunity to witness again. 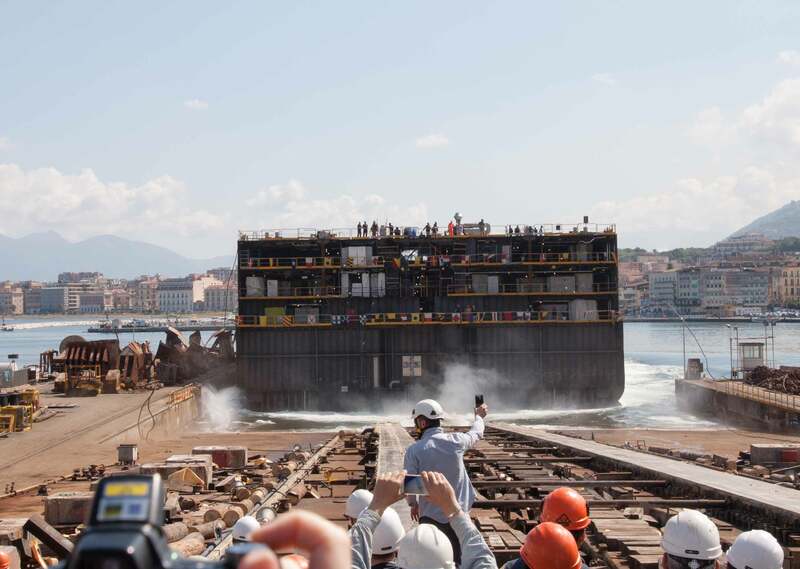 Next year, Castellammare will be building ships for the Italian Navy again, and cruise ships will be boringly floated out of dry dock once more.